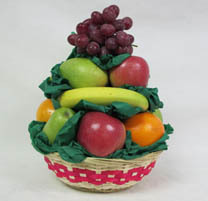 Want to add a little something extra to your Scolio Fruit Basket? 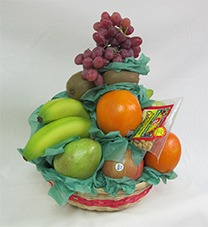 We can customize your basket with whatever additional items you bring in . . .
a bottle of wine, some additional cookies, candies? 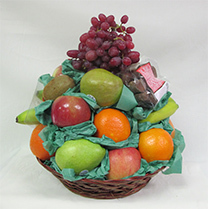 llWhatever it is, we will be happy to customize the fruit basket around your goodies! Standard Per Basket Pricing . 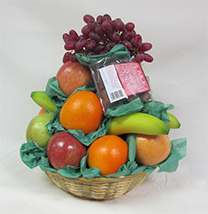 . .
Price varies on location, approximately $6.00 - $8.00 per basket. Waterford, Fairview, Girard, and Lake City. 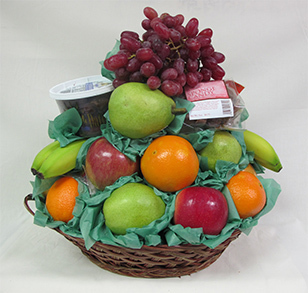 Please note that piece count in each basket varies, based on the size of the fruit and the basket. Fruit selection varies by season and quality, including grapes. Please call for information. We do not accept any credit or debit cards. Payment terms are 10 days within receipt of statement. When faxing your order, please call first so we can switch our phone line to accept the fax . . . 814-864-5421. The message you would like on the card.